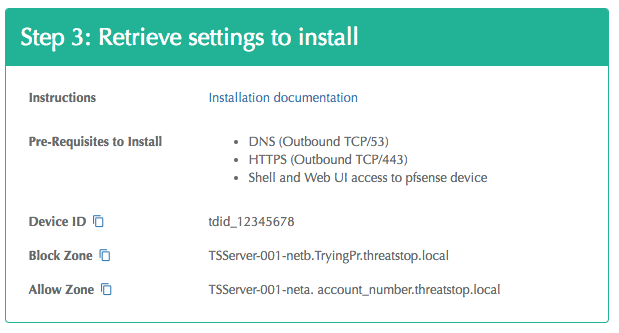 This document describes the integration process of the ThreatSTOP IP Defense with pfSense 2.1+. Automated collection and upload of log files from the pfSense device to ThreatSTOP’s systems. Note: The instructions below only apply to pfSense 2.x, pfSense 1.x is NOT supported by an automatic script. Contact ThreatSTOP support if you wish to run ThreatSTOP on a pfSense 1.x device. The integration is performed by installing a set of scripts provided by ThreatSTOP. After installing the software package, the TSCM will retrieve the list of subnets matching the policy configured via the ThreatSTOP Admin portal and maintain IPFW filtering rules. The software will also upload blocked connection logs to ThreatSTOP’s Portal, for analysis and reporting. The current version of ThreatSTOP’s pfSense integration is compatible with all pfSense devices running OS versions 2.1.x through 2.4.x. It is compatible with the Netgate appliances, the AWS/Azure images and the community edition. The current version of the ThreatSTOP integration is 1.05. Warning: Prior to installing the ThreatSTOP package, you will need to increase the Firewall Maximum Table Entries size to at least 400,000 entries in System > Advanced, Firewall & NAT. It is recommended that you save the current configuration before applying ThreatSTOP. This can be done from the Diagnostics: Backup/Restore page of the webConfigurator. During this step, you will create a device entry on the Admin Portal. You will select a device type (pfSense 2.x) and enter the configuration settings. Internal IP address: This is the internal address of the device. The TSCM will communicate with the ASA via SSH using this IP address. Note: Authentication credentials are documented below. Note: It typically takes less than 15 minutes for new device IPs to become registered in the Policy service. The software will install automated jobs in the crontab to perform updates and upload logs. It will also add a new page to pfSense’s webConfiguration, under the Firewall menu. Finally, it will retrieve the current version of your policy data. You can now enable ThreatSTOP in the pfSense webConfigurator (Firewall menu). The final step will enable the integration using the pfSense webConfiguration. Open a web browser and login into the device’s webConfigurator GUI. If not already done, click on the System > Advanced menu then select Nat/Firewall. Set Firewall Maximum Table Entries to at least 400,000. Confirm that the installation completed ok by checking the output of the setup now displayed on the page. From this point on, the TSCM will retrieve policy data (IP subnets) and update the IPFW entries, every hour. pass in log quick on em0 inet from any to <ThreatSTOP_allow> flags S/SA keep state label "USER_RULE: ThreatSTOP_incoming_lan"
block drop in log quick on em0 inet from any to <ThreatSTOP_block> label "USER_RULE: ThreatSTOP_incoming_lan"
pass in log quick on em1 reply-to (em1 172.21.70.1) inet from <ThreatSTOP_allow> to any flags S/SA keep state label "USER_RULE: ThreatSTOP_incoming_wan"
block drop in log quick on em1 reply-to (em1 172.21.70.1) inet from <ThreatSTOP_block> to any label "USER_RULE: ThreatSTOP_incoming_wan"
Re-run the tssetup.php command with the updated block and allow policy names. Select the ThreatSTOP_block or ThreatSTOP_allow to view the subnet list. 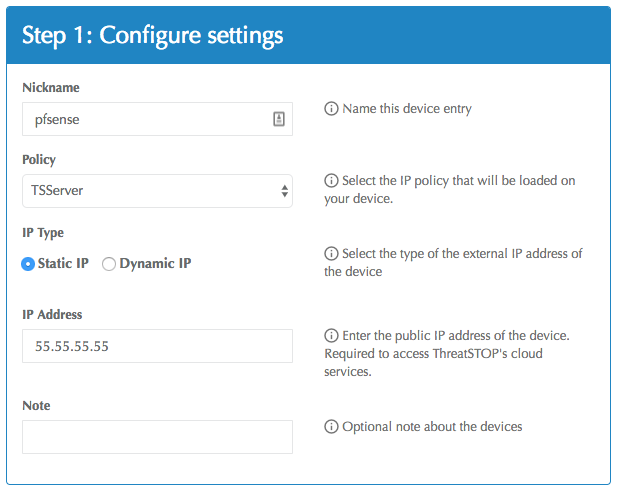 If you receive this error message while configurating the ThreatSTOP software, check the connectivity to the ThreatSTOP DNS service described above. If this is a new policy or device, wait 15 minutes for the configuration to propagate. If the issue persists, please contact ThreatSTOP support. If this error is displayed after enabling ThreatSTOP in the webConfiguration, please make sure that you have increased the firewall table maximum size.